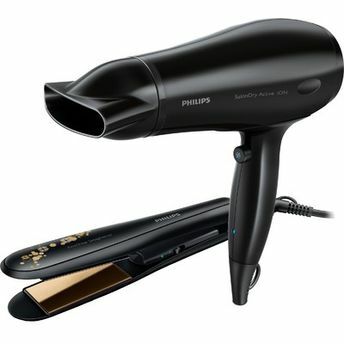 Philips KeraShine HP8316 : This wide plate hair straightener with ionic technology and keratin coating will help you to get this beautiful hair and style you want in less time. The extra large plates have been designed specifically for thick or long hair. These extra wide straightening plates have been designed specifically for thick or long hair. The increased plate width can straighten more hair in one go and will help to reduce the time taken. Give your hair an instant care with ionic conditoning. Charged negative ions eliminate static, condition the hair and smooth down the hair cuticles to intensify the hair's shine and glossiness. The result is smooth and frizz-free hair that shines beautifully.